Baked this Orange Chiffon for my cousin sister in-law, a hairstylist who gives us [my family] free hair cut and anything from hair cream to hair spray etc... A big thank you to her. 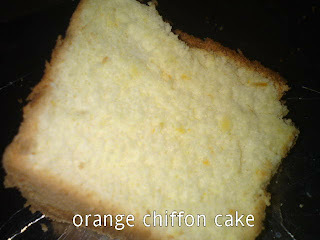 Spongy, soft and moist chiffon with nice tangy aroma of orange. 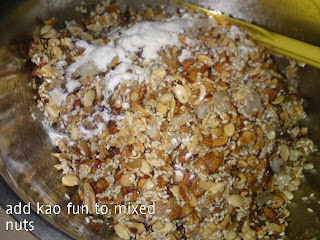 Place all the dry ingredients [sifted flour, salt and sugar] in the mixing bowl. Make a well in the centre. 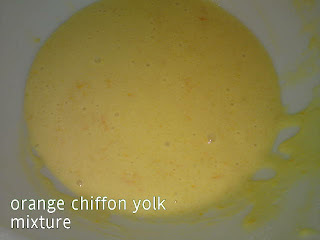 Pour in all the liquid ingredients [egg yolks, orange juice, oil and zest]. Beat together using a paddle hook on medium to high speed until well combined and mixture is smooth [takes about 5 minutes]. Set aside. 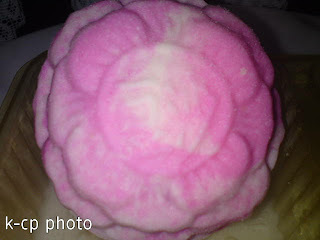 Whisk egg white in a clean mixing bowl till frothy, then add in cream of tartar. 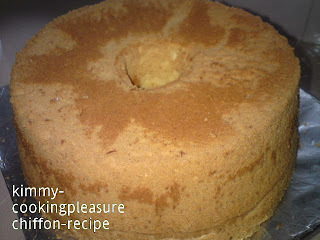 Continue beating for a second and add in caster sugar gradually. Continue beating all the time until soft to stiff peaks formed [Note - it is easier to fold in soft/stiff peak egg white mixture to egg yolk mixture]. Fold in 1/3 the egg white mixture to egg yolk mixture till well combined. Then fold into the balance egg white mixture. Fold till mixtures are well combined. 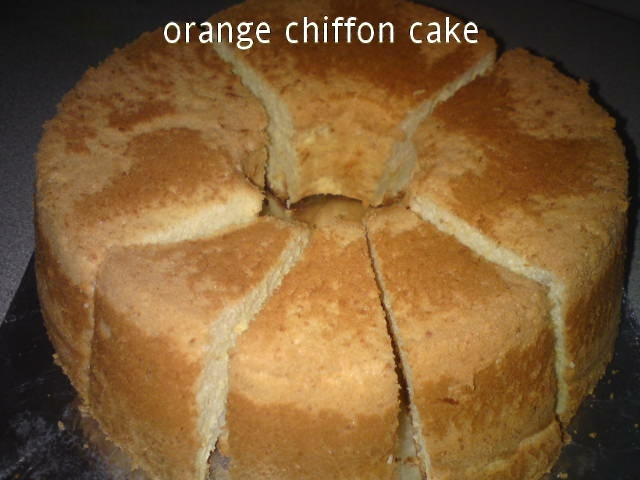 Pour into 7" chiffon pan and bake in preheated oven at 170 degrees C for 30-35 minutes on lower rack. These are my second batch of Ping Pei Mooncakes giveaways. 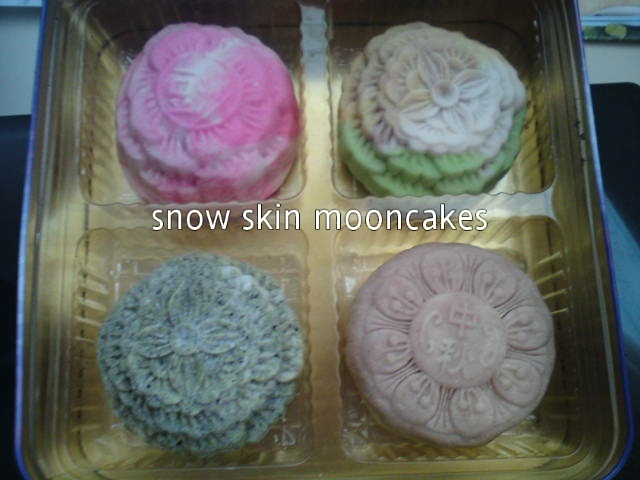 Since they are for giveaways, I can't slice them for pictures [will try to take some photos when we savour these mooncakes this Sunday on Mid-autumn festival day]. 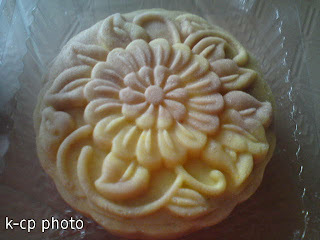 You may be wondering why I have to wait until Sunday [mid-autumn festival], cos' I don't keep any mooncakes at home. These are photos of my second batch of Ping Pei mooncakes for my mum and mother in-law. 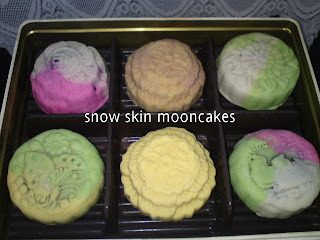 For recipes of these mooncakes, please refer here and here. 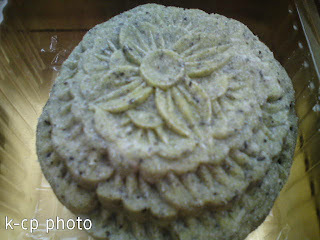 Here, I am using the Black Sesame Ping Pei Skin to wrap the mixed nuts filling [Ngoh Gin] [recipe here]. 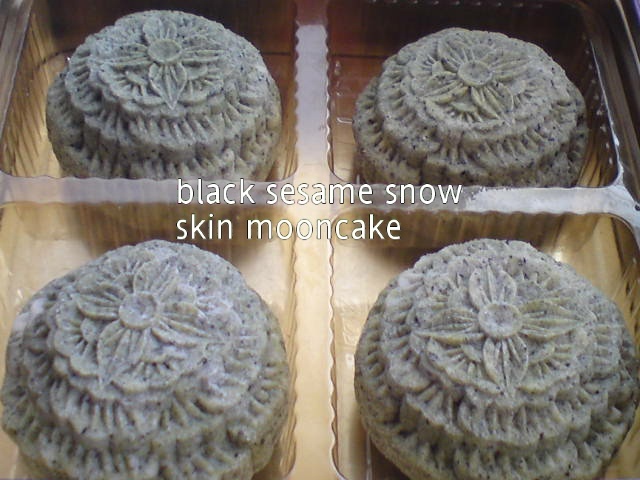 The snow skin paste has a strong, nice aroma of sesame seeds. Use a blender to finely grind both sesame seeds. Use rub-in method, add in shortening to  and mix until fine grains. Gradually add in iced cold water until the dough binds. 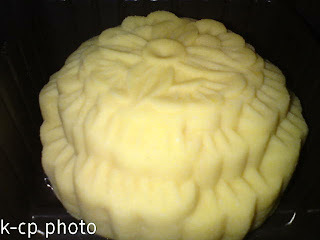 Knead into a soft and smooth paste. Cover and rest for 15-30 minutes. 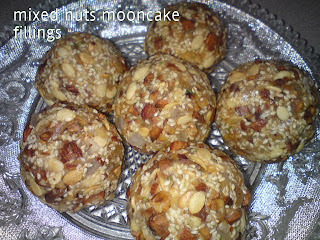 Wrap skin over mixed nuts filling, roll into a smooth ball and edges are well sealed [always dust your hands with extra kao fun to prevent dough from sticking]. 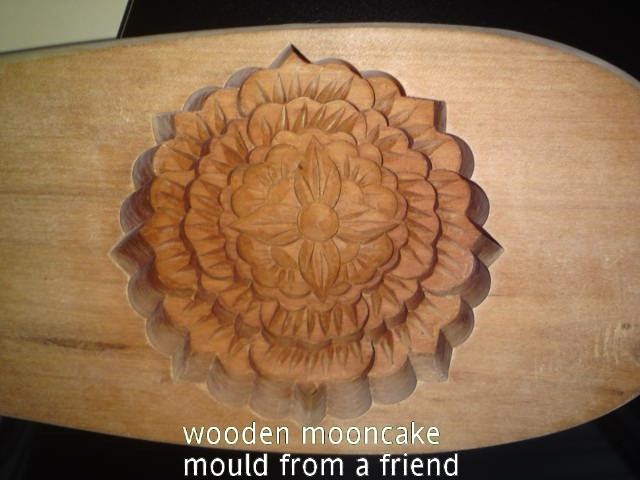 Place onto dusted mooncake mould, press to fill up the mould then knock out mooncake. 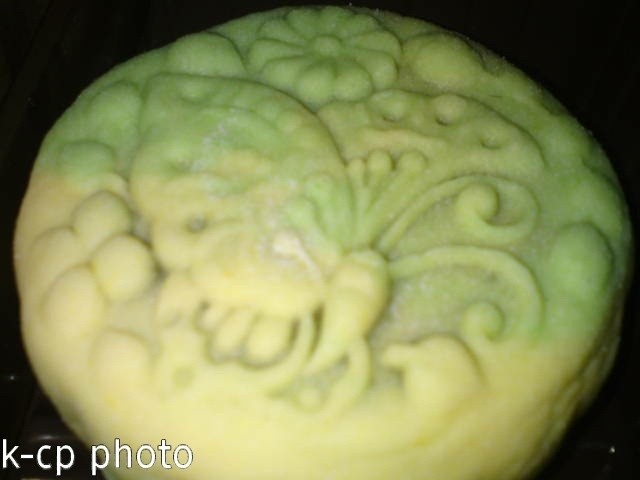 I kept 1/2 portion plain and add some yellow and green colouring to the other portion [giving some of these mooncakes to my mother in-law, she likes mixed nuts but may not like to see black and white mooncake skin]. Usually, mixed nuts filling [ngoh gin in Hokkien dialect] is used for making traditional baked mooncakes. 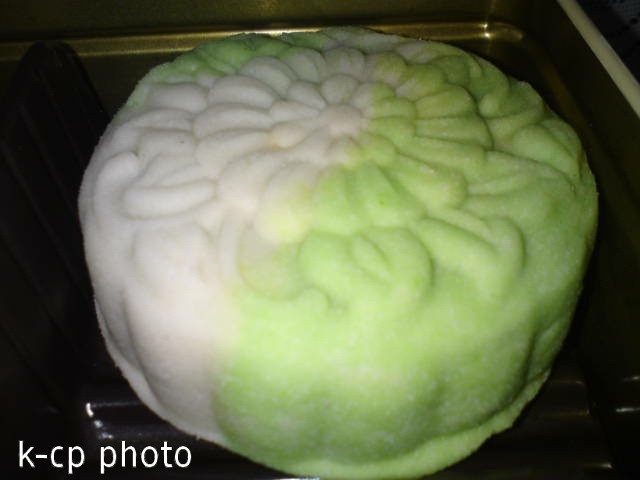 This year, I'm not in the mood for baked mooncakes since I've prepared quite a lot of figurine mooncakes [koong chye paeng]. I believe Ping Pei with this filling should be nice too with all the nuts and seeds to munch. This filling is not sweet like store bought as I have replaced some of the icing sugar with candied winter melon. 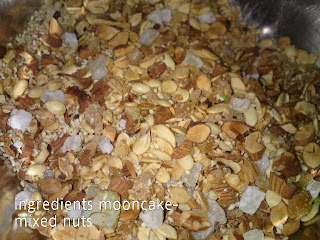 Prepare all the dried ingredients as above and place is a big bowl. Combine all the liquid ingredients together, then pour over the dried ingredients. Mix to combine well. 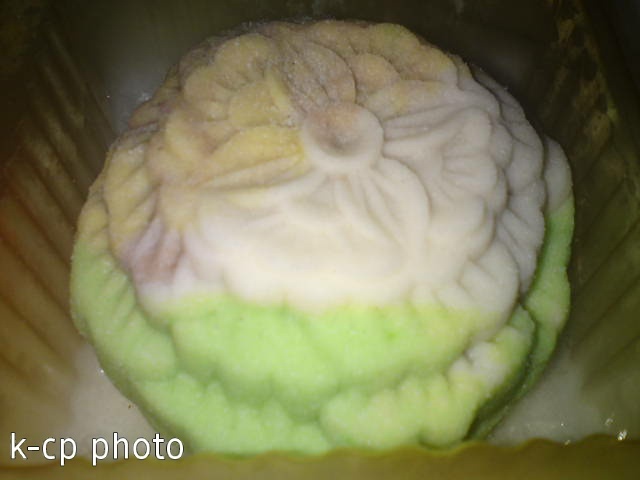 Lastly, sprinkle the cooked glutinous rice flour over the mixture. Stir to combine into a thick dough. Use your hands to shape the mixture into round balls of 110 gm each. 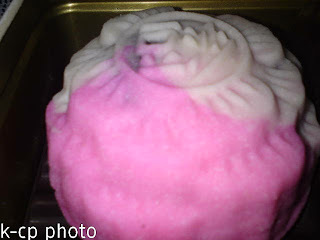 Place in a container, covered and leave them in the refrigerator until using. 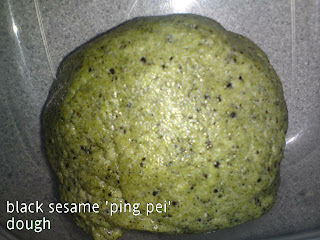 For wrapping this filling, I used the Black Sesame Ping Pei Skin [recipe here]. I'm submitting this post to Muhibbah Malaysian Monday hosted by Suresh of 3 hungry tummies. 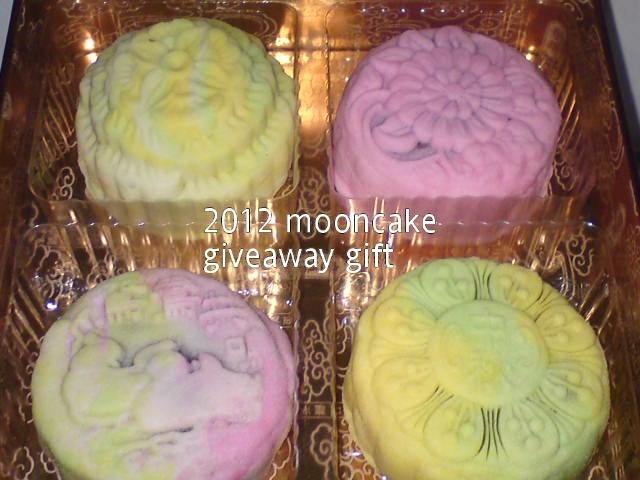 Some of my Ping Pei mooncake giveaways this year. The fillings are quite similar as previous but with different combinations. 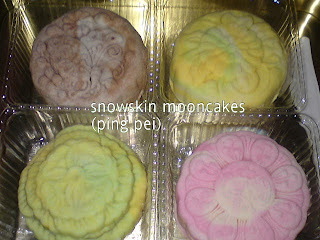 Mix together sifted flour and icing sugar, then add in shortening. Use rub-in method to mix flour, sugar and shortening together into fine grains. 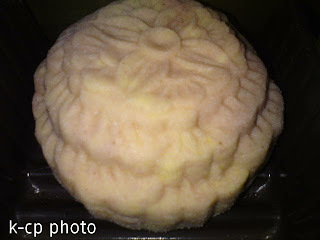 Divide dough into 12 equal portions [about 60-70 gm each-thicker skin]. 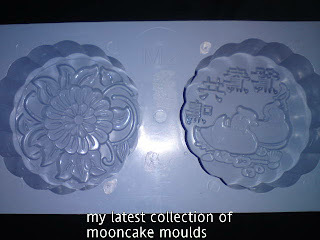 You may make about 14 pieces if using smaller mooncake moulds and less filling. Roll out 1 portion thinly into a circle that is large enough to wrap a ball of filling [about 110 gm] - depends on size of mould. Coat filling with kao fun and wrap with ping pei dough. 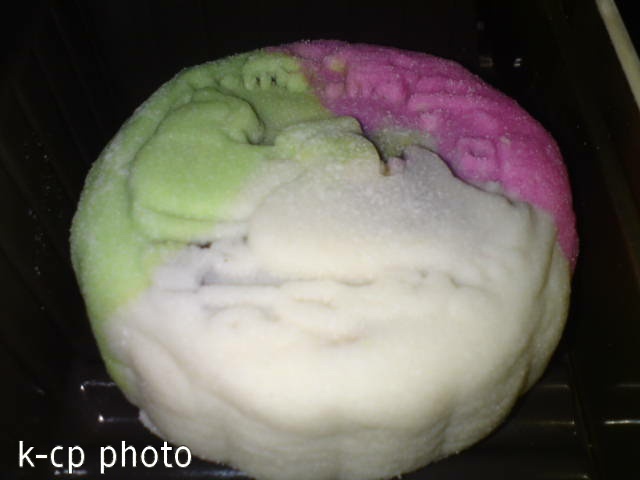 Press into mould dusted with kao fun. Knock mould lightly to dislodge the mooncake. 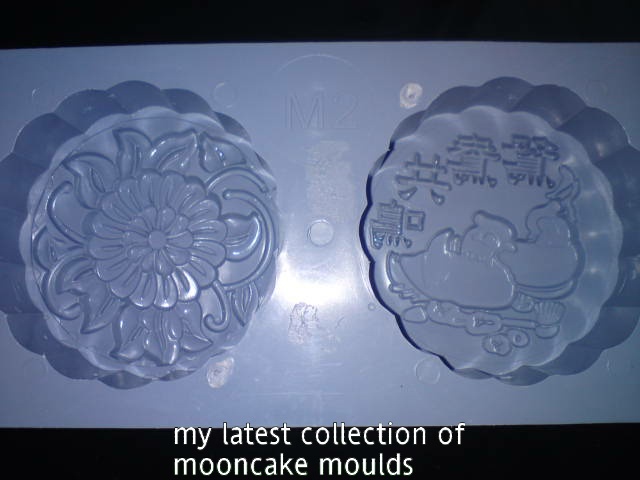 Place in plastic mooncake tray and mooncake container. Refrigerate before serving. 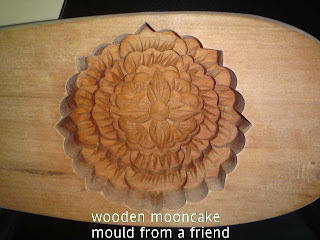 [Most of the paste can be store bought or you can make your own. 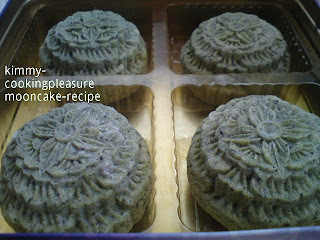 See this post for the recipe for some of the mooncake fillings. - You can make each Ping Pei in a single colour or any combination of colours according to your own preference [please refer above photos on the combination]. - These are the first batch of giveaways and second batch to come, next post [My Ping Pei 2012 [Snow Skin Mooncakes 2] with pictures only. A noodle dish I like when I thought of meatless meal. Usually will serve the noodle dish with a warm/hot sweet dessert like green beans with barley sweet soup [recipe here] or red beans soup [recipe here]. Looks like there are lots of ingredients for this noodle but take a closer look at it you will realise that you may have most of them in the kitchen cupboard or fridge. You need not follow exactly all the ingredients, just make do with what you have in hand and you will end up with at least a 'five coloured noodle', believe to be good for health [protein, fibre, carbo etc....]. Heat some oil in wok to fry firm beancurd until firm. Dish out. Using the same wok, fry young corns, lily buds and carrots for a minute. Dish out onto plate with beancurd. 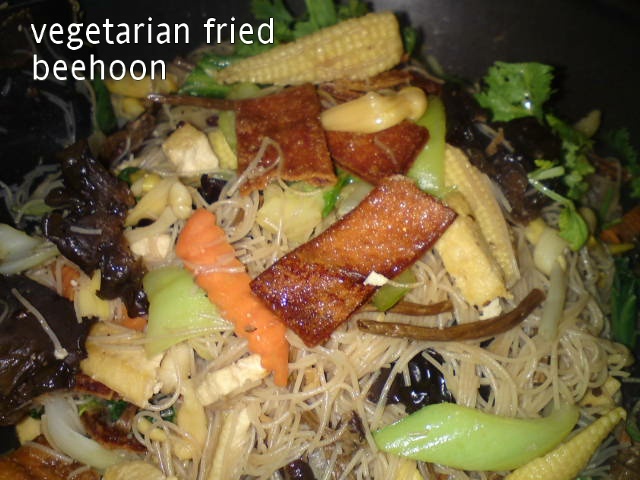 Add in dried mushrooms and black fungus. Stir fry for a minute, pour in water and add in seasoning to taste. 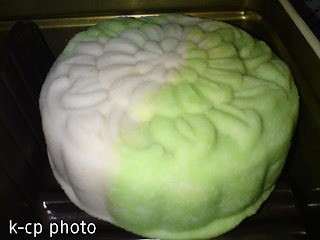 Bring it to boil and add in beehoon. Use a pair of chopstick to mix noodles with sauce. Add in the bok choy, all of the other fried ingredients and deep fried sweet beancurd sheet pieces. Mix well and cover wok to let noodles and ingredients cooked through. Takes about 3 minutes. 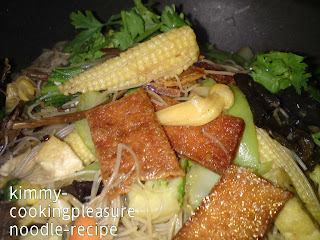 Uncover and stir fry noodles lightly until gravy is almost dried up and noodles are soft. Dish out to serve immediately with cut chillies.